Visit Bebe Bella Designs online at BebeBellaDesigns.com for baby products which are made from the finest fabrics to ensure a wonderful feeling of luxurious comfort. Bebe Bella Design offers something for those who want simple elegance, the latest trends, or something in between. 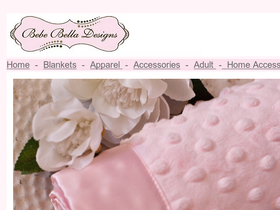 Bebe Bella Designs are well know for their over-sized receiving blankets in the softest of fabrics. Save on your next purchase from BebeBellaDesigns.com with Bebe Bella Designs discounts, Bebe Bella Designs coupons, Bebe Bella Designs promotions and Bebe Bella Designs savings from 58coupons.com. Head on over to BebeBellaDesigns.com and sign up for their newsletter to receive a $15 coupon code instantly. Shop Bebe Bella Designs for some absolutely gorgeous baby clothes starting at only $14. Click link to start shopping. Bring your newborn baby home in one of these stylish chenille hats from BebeBellaDesigns.com for only $14. Click link. Fabulously soft and beautiful chenille blankets are only $23 at Bebe Bella Designs. Click link.